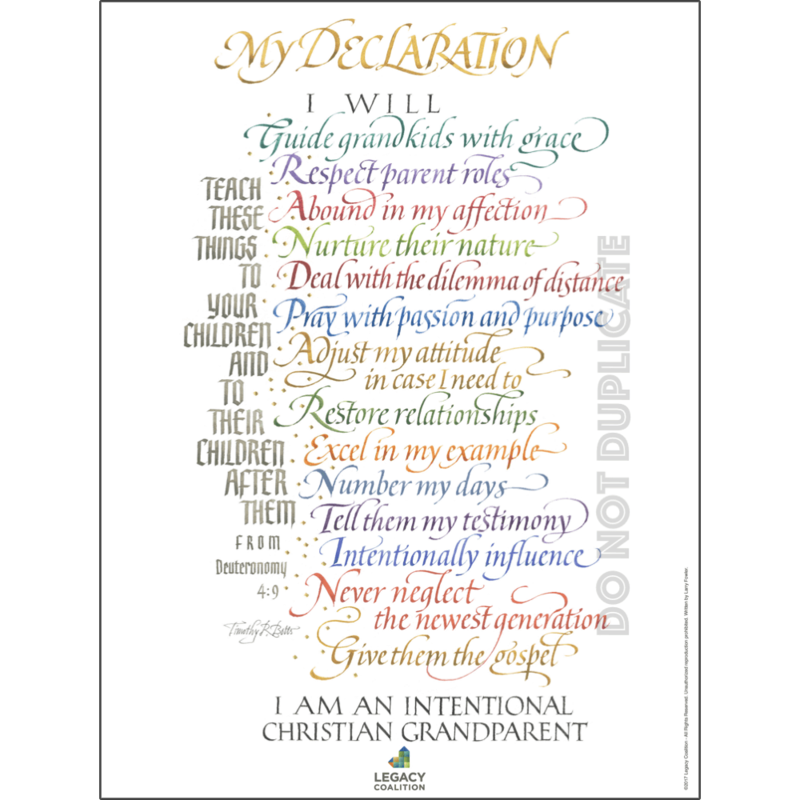 This powerful declaration expressing your commitment to be an intentional Christian grandparent is perfect for display in your home or office as a reminder to you and a testimony to your desire to leave a lasting legacy which truly matters. This lovely “My Declaration” art print will continue to make an impact for years to come. 18×24 canvas will make a stunning focal point in your home’s decor. 12×16 canvas; this smaller size provides you with more options for display. 9×12 on thick matte art paper is perfect for the small space in your office or home. 9×12 on 65# Card Stock, sold in packets of 100 prints. This most economical size is ideal for churches to distribute the “My Declaration” art print to the grandparents in their church, or to other large groups. Printed product does not show watermarked logo seen in preview here. Legacy Coalition founder Larry Fowler first wrote this declaration and delivered it as part of his opening talk at the very first Legacy Grandparenting Summit in Frisco, Texas, November of 2016. The audience was so moved, they responded in unison by standing in agreement with Larry’s declaration. Since that day, a recitation of this declaration is requested nearly every time he speaks and others have included it in their ministries to grandparents as well. Because of the overwhelming response, the Legacy Coalition asked renowned Christian calligrapher Timothy Botts, also an intentional Christian grandfather, to apply his incredible talents to create this one-of-a-kind art print, so grandparents, their families and friends will be reminded of their commitment for years to come. The resulting reproduction is printed on high-quality materials and in vibrant colors. It mirrors the original artwork, is suitable for framing and will fit perfectly in your home.